It goes without saying, but here it is anyhow: It’s no longer your father’s trade show. Sure, trade shows are still about face-to-face conversations with real, live humans. It’s still about pressing the flesh and building relationships. But most exhibitors now augment that valuable personal interaction with some kind of digital technology in their booth. From mobile phones to tablets to flat screens and touch screens, exhibitors bring the same tech they use at home and work into the trade show arena. 1. Does our upcoming trade show provide lead retrieval machines and/or an app that works with the attendees’ badges? While most exhibitors simply gather business cards for their trade show lead management, many rely on the lead retrieval machines they can rent from the official show provider. However, more and more shows are making a lead retrieval app available for use on smart phones and tablets. And some shows are even discontinuing lead retrieval machines in favor of these apps. So you need to figure out which of these you are doing at your show, so you can not only order the one you prefer, but then also customize the lead retrieval machine or the app to match your at-show lead qualification questions, and your post-show data format needs. 2. Do they have an official on-site tech rental company for tablets, monitors, and touch screens? Because tech rental at a trade show can cost about the same as buying it, you may own your tablets and monitors, and are happy to ship them to the show and back repeatedly. If you don’t like to own trade show tech because of concerns about breakage, set-up, and obsolescence, then on-site rental is the solution. Just make sure they have in inventory what matches your needs, and that whatever applications you run will be loaded on them, and compatible with them. And get their phone number before the show starts, so if you have issues during set up or the show, you can quickly reach them – that support is also what you paid them for! 3. What kind of internet connection is available from the show? Many exhibitors who use tech (like our trade show booth games) need to have the Internet in their booth, whether it’s for their lead retrieval app, showing off their website, or to present with an internet-based app. And so almost every show offers both Wi-Fi or hardwired Internet to exhibitors – at a very high price. If you use the show’s Internet, you get support and ease of use. And if you have a mission-critical need for dependable Internet or higher bandwidth, you may have to go with a hardwire connection. Since the FCC ruled that wifi blocking is illegal, we have found that using a hotspot or your own wifi is a viable and reliable solution in many venues. Talk to your company’s I.S. department about your options, including getting your own wireless internet hub to bring to shows. 4. What is the show’s hashtag? Social media has become one of the strongest forms of pre-show and at-show promotions. As you publish messages on Twitter, Facebook, Instagram, and LinkedIn (at least on the LinkedIn app, for now), use the show’s hashtag to give your messages the chance to be found by even more attendees – and even people who won’t attend, but are good prospects for your products. Just be sure to go to the show’s website and find out what their official hashtag is for that show, and even that year of the show, as it can change! Some shows include the year in their hashtag, and some don’t. And sometimes the show even changes its name! Also, click on the show’s hashtag on each of the 4 social media sites mentioned to see who included the hashtag in their messages, and then determine if they are people who you’d like to invite to your booth. 5. Does the show or show owner have its own LinkedIn group? People you want to meet at the trade show are already gathered virtually in many LinkedIn groups, but especially if the show has their own LinkedIn group. You can research the group’s discussions to see who (among buyers) is already talking about going to the show, and reach out to invite them to visit your booth. You can also post your own discussion about what great new things you will be launching at the show inside the show’s LinkedIn group. If there is not a group owned by the show, then find the largest, active group that caters to your buyers, and get involved there. Tech is here to stay at trade shows. 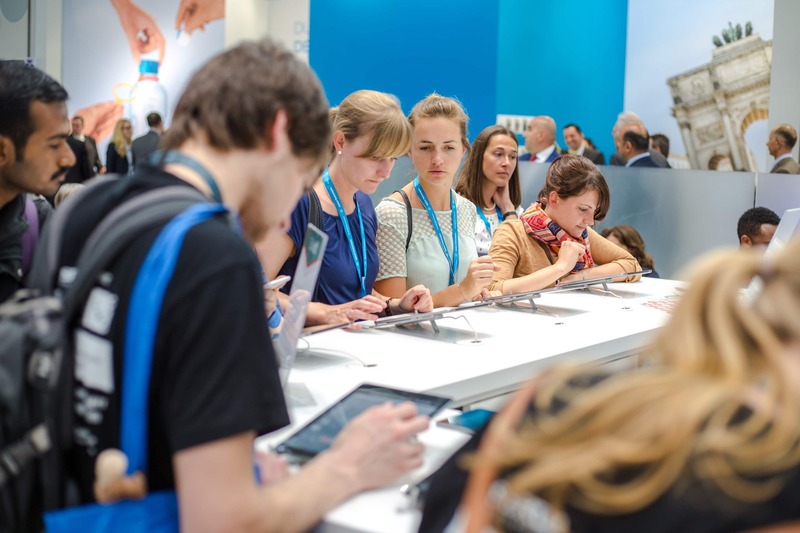 Exhibitors like you have embraced the attention-getting power of digital devices and screens to get more attendees and create better experiences. Use these 5 questions to ensure you are prepared to get the most out of the tech you use at every trade show.